By Lady Elena de la Palma, Head Retainer to Their Majesties Timothy and Gabrielle. Have you ever attended an event with royalty and noticed someone standing behind or beside Them? Perhaps holding a cup, perhaps taking notes? Those people are not there by accident – they are retainers, and Their Majesties Timothy and Gabrielle invite you to try something new and be one yourself. 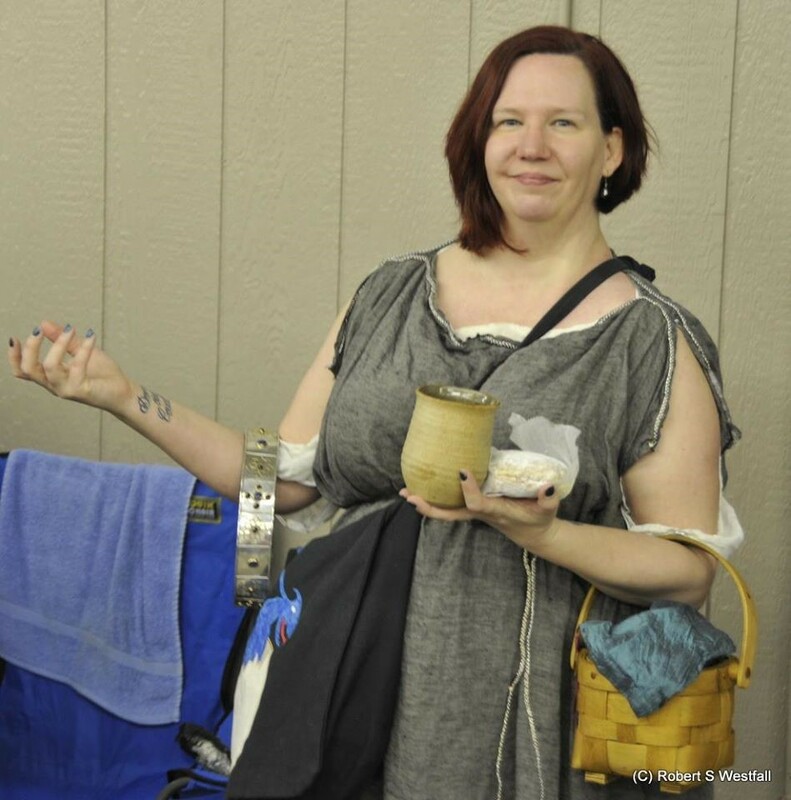 Lady Catherine O’Herlihy demonstrates experienced retaining at Ice Dragon, balancing a cup, a snack, a basket, a bag, and the Crown of the East Kingdom. Photo by Baron Steffan Wolfgang von Ravensburg. Retaining is an incredibly important part of The Dream. Retainers ensure that Their Majesties (and Their Highnesses) are kept comfortable and supplied with what They need so that They can keep their focus on the populace. The retainer attends to all the details: ensuring that Their Majesties are supplied with food and drink; carrying gifts and other important items; and helping Their Majesties stay on schedule during the day of the event. They may also be called on to seek out gentles with whom Their Majesties would speak, or even to maintain a perimeter of silence should Their Majesties need to have a private conversation. Retainers wearing baldrics attend Their Highnesses during the procession at Queen’s Rapier Championships. Photo by Hersir Torvaldr. What do retainers do during Court? Retaining during Court is a little different from retaining during the day. The basics are the same – you ensure that Their Majesties’ cups are full and take any gifts that might be received – but the way it happens is a little different. 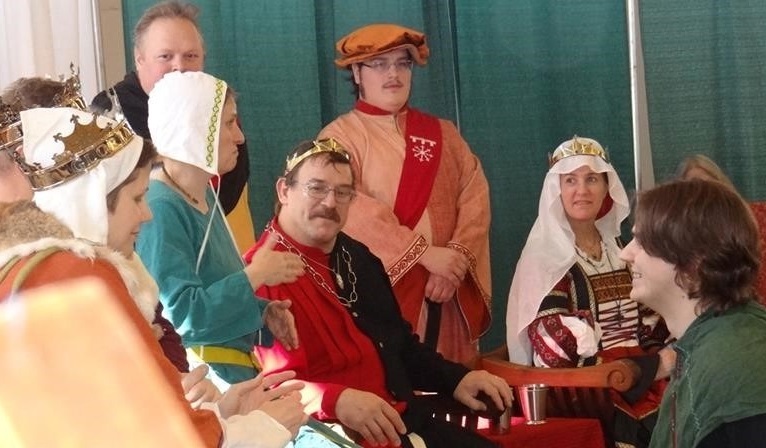 Before Court, all of the retainers will gather with the Queen’s Guard, the Kingdom Champions, Their Majesties, and Their Herald, and process into Court with the group. Then, the retainers will take shifts standing by Their Majesties during Court. The Head Retainer coordinates the shifts, switching retainers out at regular intervals so that no one stands for more than a few minutes. Retaining during Court is a really unique experience. You’re looking out at the populace from behind the royalty and very close to those receiving awards – not a view you usually get every day! Retainers attending Their Majesties and Their Highnesses at Ice Dragon Court. Photo by That Guy Phil, Unsung Hero of Miscreants and Other Tourists. But…that doesn’t seem so hard! These duties may sound simple, and they are – but that’s the beauty of it: anyone can retain! It doesn’t matter whether you are new to the society or have been here for years. I did my first retaining shift at the first event I attended that had royalty present. I barely even knew what a King or a Queen was! I volunteered that morning, and after a few hours and a quick introduction to retaining I found myself watching a tournament with the Queen, her goblet in my hands. The real skill of retaining comes from learning how to anticipate the needs of Their Majesties before they ask. One can retain perfectly well without this ability, but it’s one that all great retainers master. Do I need to prepare to retain? You don’t have to do anything, but it is very important look to your own comfort. Wear comfortable shoes and comfortable clothing that will let you move around, hold goblets, carry gifts, and otherwise move without hindrance. Make sure that you’ve eaten before your retaining shift starts. Make sure that all your own needs are taken care of so that you’re free to focus on attending to the needs of Their Majesties. Absolutely! Their Majesties love to meet new people, and it’ll be my pleasure to ensure that you’re completely comfortable with your duties as a retainer before your first shift. Just get in touch with me and we’ll get everything set up. 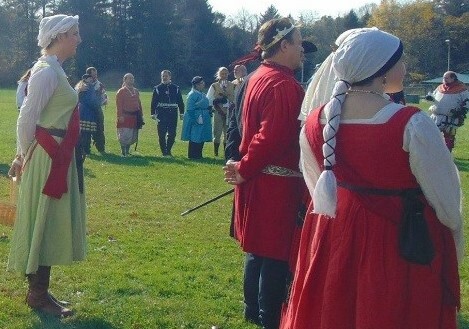 Their Majesties will need retainers at every Royal Progress event during Their Reign, starting with the A&S Faire in Nithgaard this weekend and including Pennsic and Æthelmearc War Practice. It’s very easy to dip a toe in the retaining waters – shifts are usually an hour long and cover either His Majesty or Her Majesty, not both. We’re happy to schedule you around any other commitments you might have at the event – just let us know! Even if you’re busy all day, having another retainer for Court is always lovely. Everyone is welcome. Whether you’re a brand new retainer or an old hand, Their Majesties welcome your service and thank you for it – and they’d love to meet you! If you’d like to learn more, contact me or find me at an event. I’d love to talk with you about retaining and answer any questions you have.